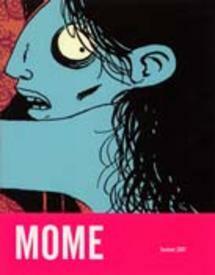 MOME 8 - Summer 2007 is edited by Eric Reynolds and Gary Groth. This issue pretty much completes the transition to the new "Team MOME." Original members Jonathan Bennet, Sophie Crumb and Paul Hornschemeier are joined here by new comers (some of whom showed up last issue) Eleanor Davis, Ray Fenwick, Tom Kaczynski, Al Columbia, Émile Bravo and Joe Kimball, while Lewis Trondheim wraps up his three-part "At Loose Ends." Davis is the featured artist this issue with her work gracing the cover and providing the lead story, while she is the interview subject as well. Her story, "Stick and String" is a moody meditation on exogamous bonding that shows her work moving a bit in the direction of Sammy Harkham (although, in her interview, she identifies Joann Sfar as her current fave). The Copacetic pick for this issue is Tom Kaczynski's "10,000 Years," a mordant take on contemporary alienation that, while clearly indebted to Clowes, brings an original perspective to the table with its smart synthesis of dialectical materialism and post-industrial consumer culture. And we can't sign off on this issue without mentioning Émile Bravo's "Young Americans," which is certainly one of the cleverest short comics we've read in a while.